On January 30th, 2019, the Vancouver Children’s Literature Roundtable will honour award-winning authors Monique Gray Smith and Tanya Lloyd Kyi. 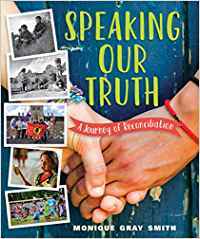 Speaking Our Truth: A Journey of Reconciliation, by Monique Gray Smith. Published by Orca Book Publishers. “In Speaking Our Truth, we are embarking on a journey of reconciliation. This isn’t a read-and-do-nothing kind of book. It is an active exploration of Canada’s collective history, our present and our future. It’s about how we grow as individuals, families, communities and as a country. 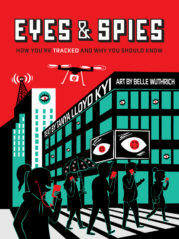 Eyes & Spies: How You’re Tracked, and Why You Should Know, by Tanya Lloyd Kyi. Illustrated by Belle Wuthrich. Published by Annick Press. “Who is watching you . . . and why? When: January 30, 2019, 7-9 pm | Doors open at 6:30 pm. This entry was posted in awards, books/writing, CWILL BC news & events, latest news, literary events, new publications and tagged Belle Wuthrich, CWILL BC, Monique Gray Smith, Tanya Lloyd Kyi, Vancouver Children's Literature Roundtable. Bookmark the permalink.